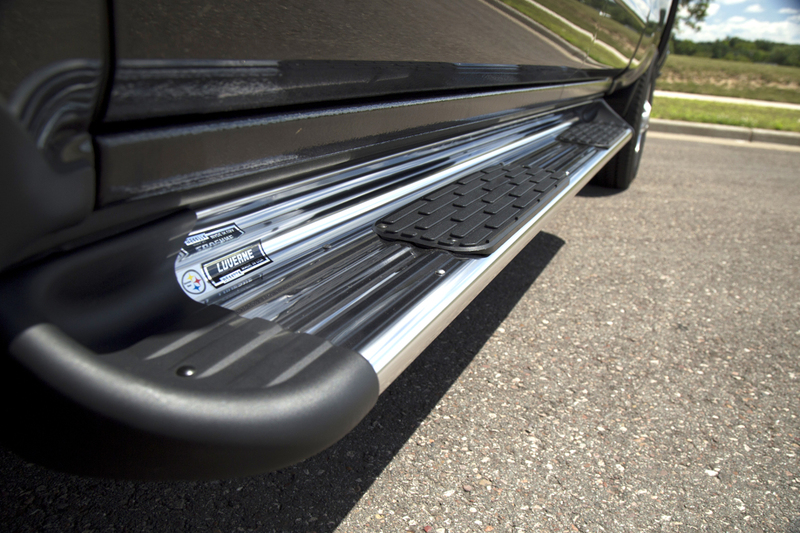 A vehicle-specific design for each set of Side Entry Steps ensures the best fit possible. 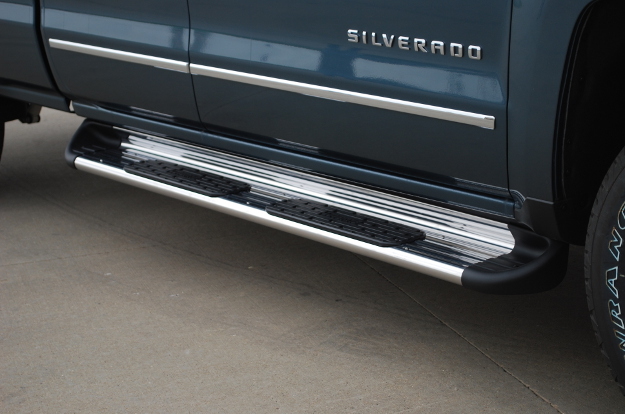 The side steps integrate with the vehicle's layout, mounting flush against the rocker panels. A custom fit also means an easier installation. 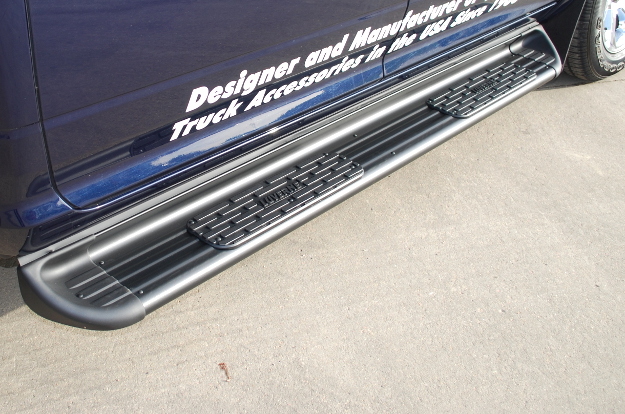 Each pair of Side Entry Steps is able to mount onto the unique truck application without requiring any difficult vehicle modifications. 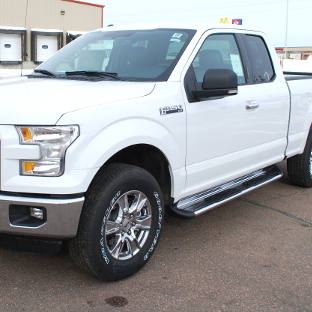 Side Entry Steps are styled after classic truck running boards because of the unique advantages that this design offers. 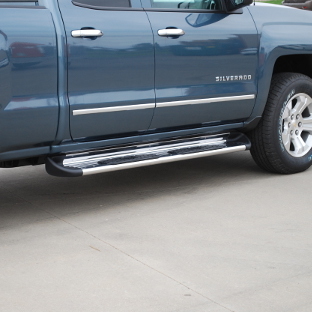 First and foremost, these running boards provide a reliable, non-skid step when entering or exiting your truck. 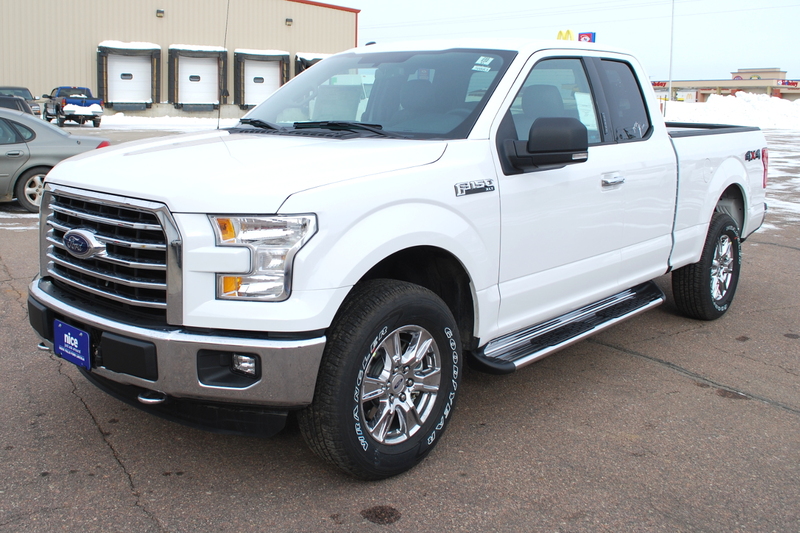 Their flush-mount design also offers a more integrated look on the truck, accenting its body lines and complementing its existing features. 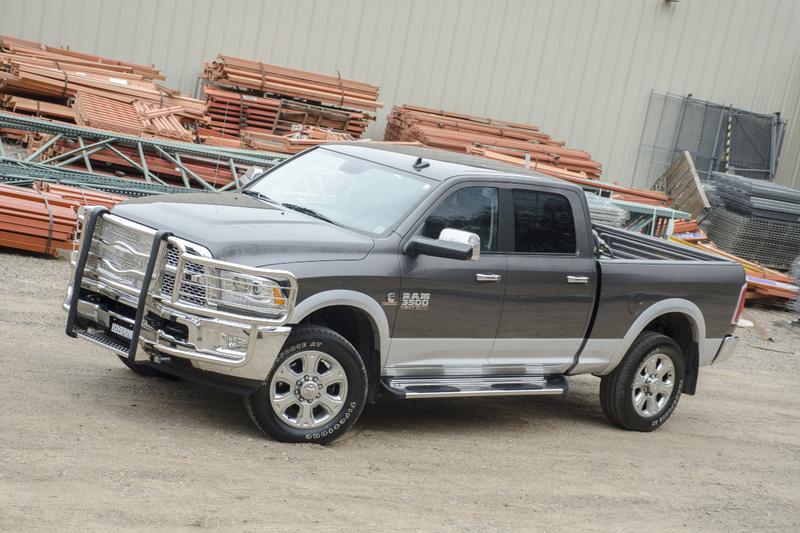 An additional advantage of the flush mount is extra truck side protection. 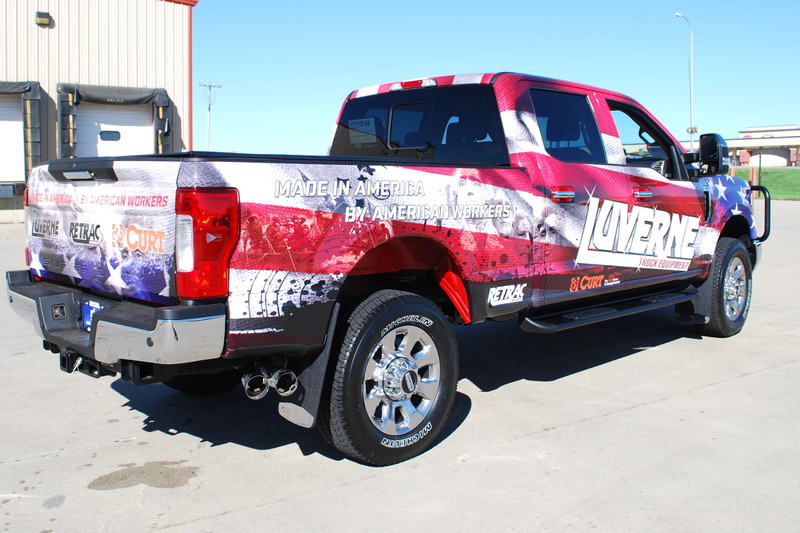 LUVERNE Side Entry Steps mount high and tight against the vehicle's rocker panels, giving the sides of the truck an extra wall of defense against flyaway debris and gravel spray from the tires. 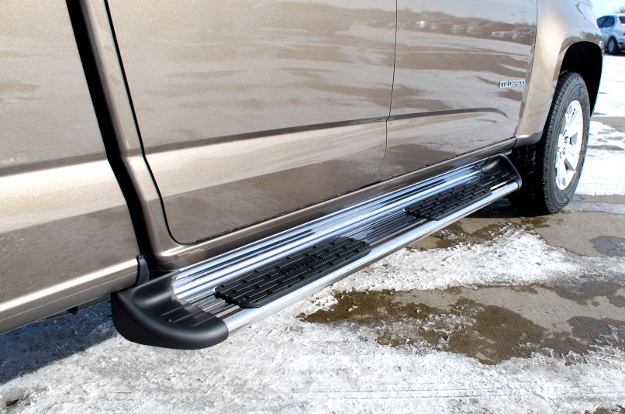 This extra side protection is a benefit on and offroad, making stainless steel Side Entry Steps a value to work trucks, commercial trucks, offroad builds and daily commuters. LUVERNE Side Entry Steps are built right here in the USA using stainless steel. This ensures consistent strength and rigidity, while maintaining long-lasting rust resistance in spite of rain, snow, sun, dirt, mud and more. 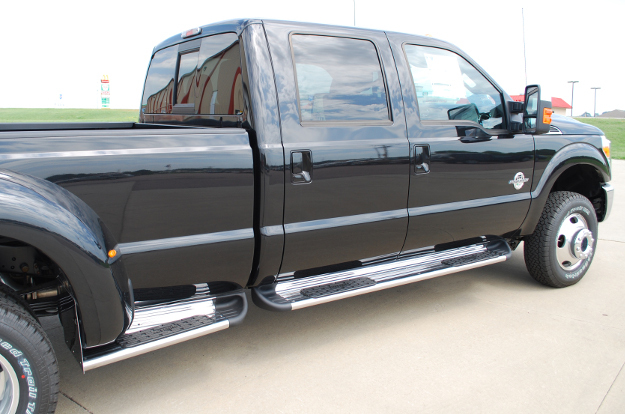 These truck running boards are a superior choice for the jobsite and offroad trail. 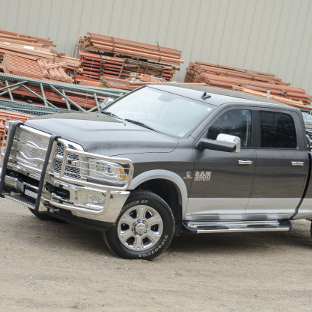 Their stainless steel construction allows them to be a dependable extension of your truck, wherever the job takes you. 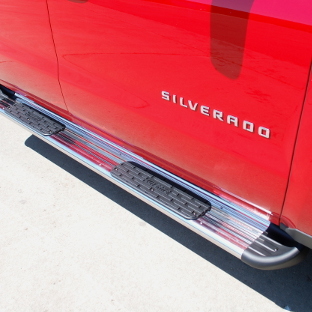 We offer our stainless steel side entry steps in two finish options, giving you the opportunity to select whichever look best complements your truck. Our polished stainless steel side steps are made with 436 stainless steel. 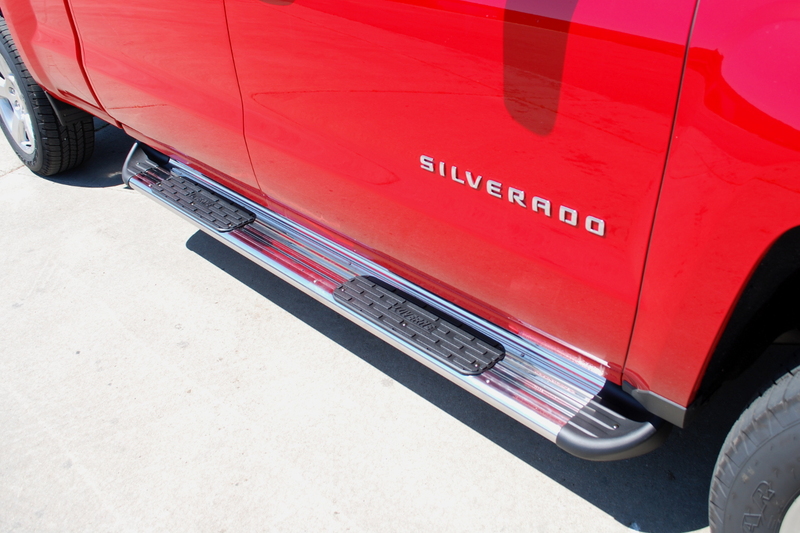 These running boards have a high-polish finish for a bright shine. 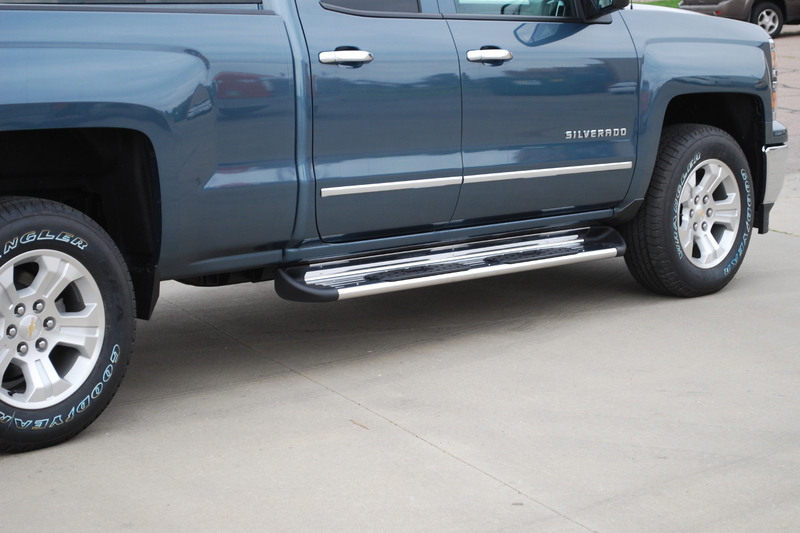 Our black stainless steel side steps are constructed from 409 stainless steel and are finished with a textured black powder coat for a professional look and maximum rust resistance. Side Entry Steps provide a confident first step on each new job or adventure. 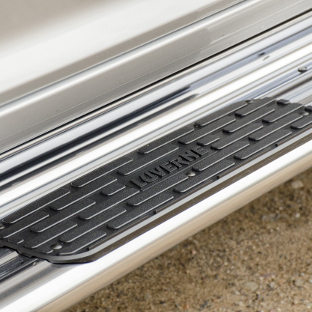 They feature tough, molded polyethylene step pads, strategically positioned on the running boards to complement the door layout. The step pads are highly wear-resistant and UV-resistant to withstand regular foot traffic and frequent exposure to the elements. They provide a comfortable 7" wide stepping surface and are complete with a textured surface for excellent traction. To finish off the classic look of our Side Entry Steps, they are equipped with black contoured end caps. 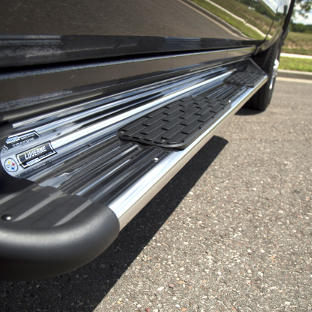 Both finish options feature these tough black plastic end caps, adding a bold accent to the running boards, and contributing to the integrated look on the truck. 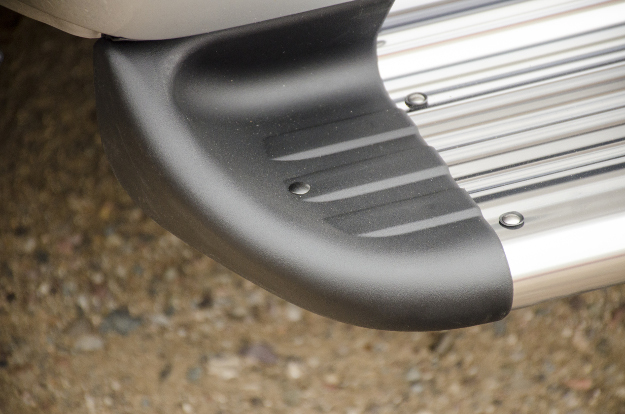 The end caps also provide the running boards with extra protection against loose gravel and road debris kicked up by the tires. Rather than the boards themselves getting scuffed or scratched, the durable plastic caps takes the blow, maintaining a clean consistent finish. 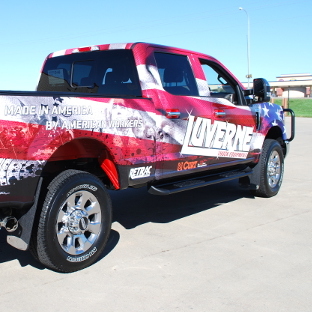 Getting a truly integrate look and fit requires a vehicle-specific approach, and that is why all LUVERNE Side Entry Steps are made for vehicle-specific application. 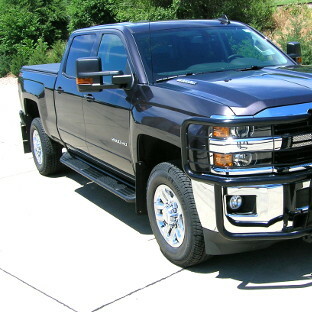 On each set, the running board length, step pad layout and mounting bracket configuration are all engineered to fit a unique pickup truck application. This provides the easiest possible installation, eliminating tedious modifications to the vehicle. 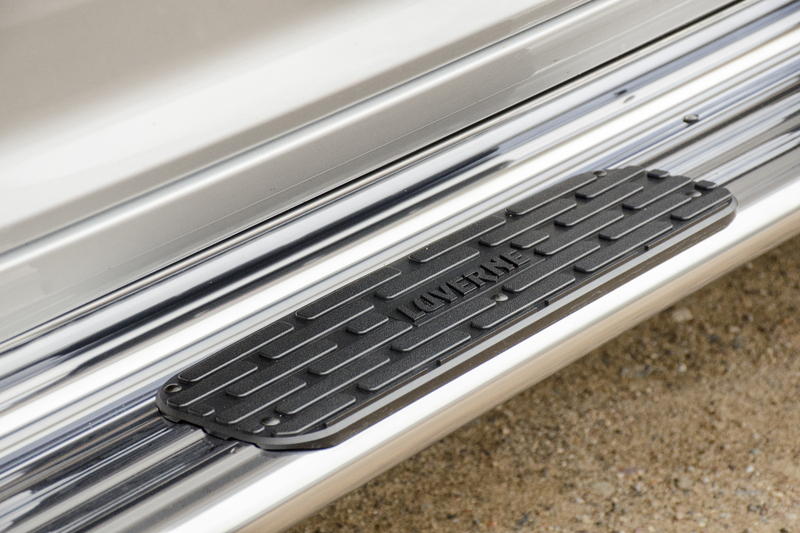 LUVERNE Side Entry Steps are available in a unique wheel-to-wheel option for added truck bed functionality. 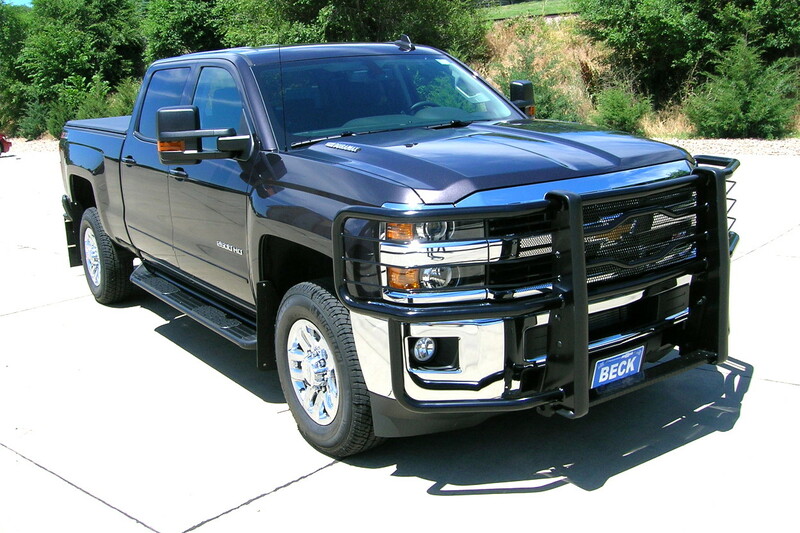 Truck box extensions can be purchased in addition to the running boards, mounting behind the truck cab and providing easier access to the truck bed. 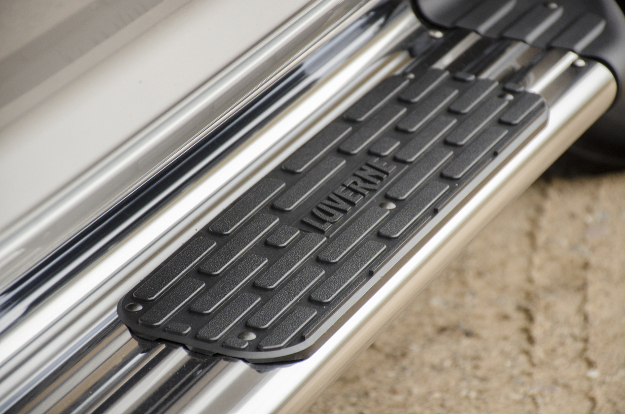 Box extensions are available in the polished stainless steel finish only, and they feature the same durable construction, bold black end caps and non-skid step pads as their running board counterparts.